Is Grenache on the way back, or is it just me? It’s hard to argue against the suitability of Grenache in the Barossa Valley really, particularly on the warm, sandy soils of the Barossa floor. Those old ‘bushies’ just keep on keeping on, even during warm vintage after warm vintage. It’s like they were made for the place. Sadly winemakers aren’t quite as convinced about how good Grenache can be, leaving the variety as still somewhat unwanted. I heard of 80 year old bush vine Grenache only the other week that was going for $700/tonne, while younger, higher yielding Shiraz vines on the same block were getting $2000/tonne. So is the return of Barossa Grenache just a sentiment? A thread that us wine writers pick at, because we believe in it, even though most drinkers just skip on by? Anyway, this Grenache is exactly the sort of wine to be leading the charge (I hate that cliche. Let’s just say, the sort of Grenache that I want to show the potential). 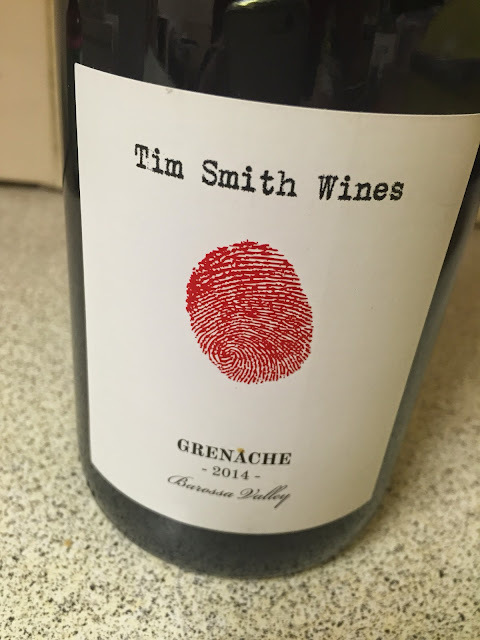 Made from one of those old Grenache vineyards, and matured in large format oak, Tim Smith has crafted here a lovely varietal Barossa Grenache that looks the part. Red cherry and raspberry fruit; underlying vanilla oak giving some sweetness (the wood sticks out a bit now) and a gentle palate that is both lively and hearty. It’s perhaps a fraction warm, but that is also a key component of Grenache in the Barossa, and the alcohol sweetness complements the sandy tannins. Would I buy it? I’d wait a few year, but this would be an easy bottle to finish in about 3 years time. All of Tim Smith's wines are excellent – great producer. Don't think Grenache is making a mainstream come back but certainly is more relevant in hatted restaurant land / wine bars + the few fine wine retailers. Much to do with the current wine making style too – old vines, not over extracted and no/not much new oak. Same with Barossa Mataro, the old vine Grenache are cheap compared to Shiraz, esp old vine Shiraz. Best blocks/barrels of these varieties allowed to successfully stand alone. GSM blends also improving by backing off new oak & less extract. Yes! Barossa Pinot! More power to it.